I live one mile from the beach in Southern California. When I water bath can at home, I’m at sea level. So, I just follow the recipe and I’m good to go. But when I can at my family’s 1892 Farmstead (which is at 2,400 ft), I have to make adjustments to my processing times because I am canning at a higher altitude. The idea of making adjustments can confuse newbie canners, especially since many recipes assume the canner just knows how to do this. Unfortunately, it is not always spelled out. 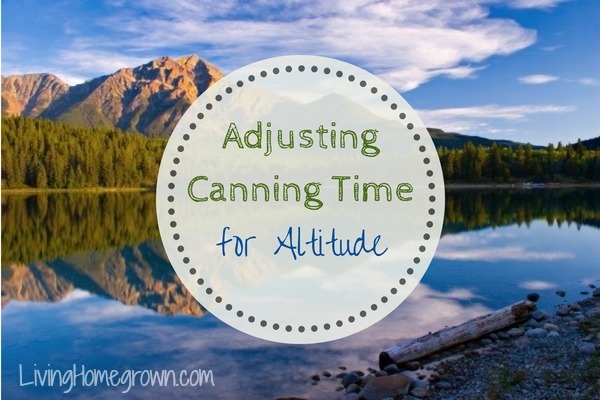 Even if you are an experienced canner, it helps to understand the “why” when it comes to altitude adjustments. So in today’s post, I explain why altitude makes a difference in your water bath processing time and how to adjust for it. In water bath canning, the food is held at the boiling point for a certain amount of time and that kills the bacteria that cause spoilage. 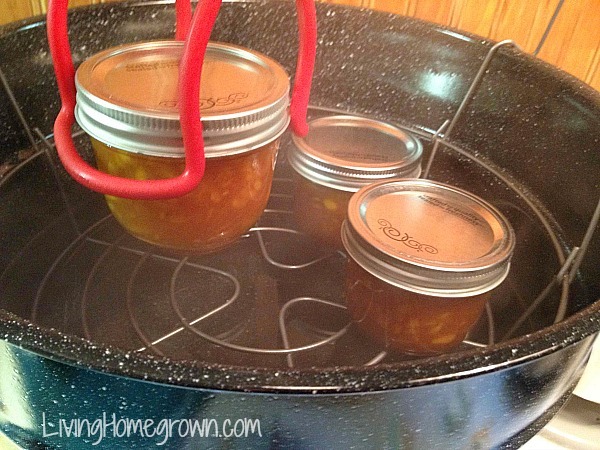 At the end of every recipe, it will state the amount of time you are to boil the jars in the water bath. You are also supposed to adjust that time based on your altitude. 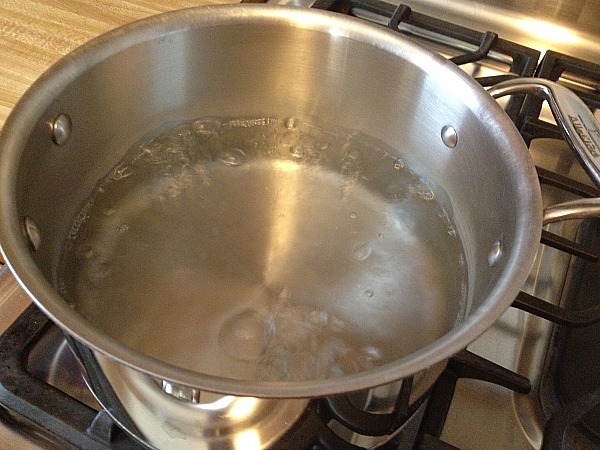 At sea level, water boils at 212 degrees F. But as you go higher in elevation, water boils at a lower temperature. For example, water boils at just 204 degrees F at 4,000 feet and at 203 degrees F at 5,000 feet. This reduction in the boiling point happens because of the decrease in air pressure. In other words, there is less pressure pushing against the water molecules and preventing them from vaporizing into steam when they are heated. So at higher altitudes (with less pressure), water molecules get agitated and break apart (turning to steam) more easily than at a lower altitude with more pressure holding them together. What is most important to understand is that when you boil water to make a cup of tea in the mountains, that water is really not as hot as it is when you boil water at the beach. Why Does This Matter in Canning? This natural phenomenon is important in canning because we are relying on temperature to kill the bacteria that causes spoilage. If the water is not as hot as required, it will take longer to kill the bacteria at that lower temperature. So, all you have to do to be safe, is process your jars a few minutes longer so that the temperature has enough time to kill the bacteria in question. Over 10,000 ft – Why are you canning? Come down off that mountain before you hurt yourself. What if you are canning somewhere and you don’t know your altitude? The answer is simple. Google it. Do a search on “your city location and altitude” and Google will tell you what the altitude is. Then check the chart and add the appropriate extra minutes to your processing time. You can also check with the your local county extension office, but Google is faster…naturally. So, don’t be worried about the altitude adjustments. As long as you understand the reasoning behind it, it is easy to do! What is the highest altitude you’ve canned or cooked at? For me, it was 6,000 feet. Baking a pie was…a little challenging. Good to know! I have a question, however, about pressure canning. I pressure can at 10 pounds while here in the Sacramento Valley (elevation 53ft), and will have to can at 15 pounds pressure when I move up to my future homestead (elevation 3,000 ft). Here is the question: Are my jars canned at 53 feet and 10 pounds of pressure safe to travel up to 3,000 ft? Will the seals pop? Sorry for the delay in answering, but I wanted to run my answer by some other engineers to be sure I was thinking this through correctly. This is sort of technical, but I want to be sure you understand the “why”. When we can something, we are creating a internal vacuum – which is negative pressure inside the jar. When sealed at sea level, the jar has a certain negative pressure. The outside of the jar is basically a certain level of positive pressure. The exact amount of pressure is hard to say because it varies from jar to jar, lid to lid, new vs old lids, amount of air in the jar, temperatures, etc. etc. When you take those jars up in altitude, the external air pressure goes down which means the internal negative pressure goes up until eventually (at some altitude), there is no longer a negative internal pressure and the seal breaks. We discussed this and think this would happen at a much higher altitude than 3,000 feet (probably more like 5,000 and higher depending upon the starting negative pressure in the jar). But as noted above, some of your jars will have more negative pressure than others. The jars with a stronger seal, should be fine. I have family members who have taken canning jars up over a high mountain pass (starting at 4,000 and going up to 11,000 feet and ending at 8,000) and they had some jar seals pop and some not. So it all depends upon the starting initial pressure inside your jars. And that varies from batch to batch, person to person for all the reasons I gave above. So the answer to your question about whether or not your seals will pop?…Maybe, but probably not. Ha ha. Seriously though, I think you will be okay. You might lose a few. But most should make it. The highest altitude that I’ve cooked at was 6,271 ft. I lived in Rock Springs, Wyo. when in junior high and we had to learn the elevation for our home ec class. We cooked several things but the one I remember was chocolate cake. I still have the recipe somewhere. I live in Colorado,so regularly can at an altitude of 7,300 ft. So far have not had any problems,just have to adjust the canning time for all the recipes. Awesome! My sister-in-law cans at that altitude too. Great article we live at around 3,000ft and it was certainly an adjustment when we moved here but great canning advice. Seriously, thank you so much for this. I’m a canning n00b. I was trying to decipher all these charts and numbers I found from various sites. The Ball book was no help and I was just getting more confused.. My elevation is 2,191 ft, so I know now to add five minutes for my jelly. Yay! I found this site extremely useful for determining elevations: http://veloroutes.org/elevation/ I like it because it gives you a number based on your exact address. Thanks Re – Glad you found the post helpful. And thanks for the link on figuring out the exact elevation! I live at 6700 ft., and was having a terrible time with losing liquid from the jars when pressure canning. I read many articles, and finally came across one that told of adding 1/8 inch headspace, for every 1000 ft. elevation, to the already 1/2 inch. So I had to leave 1 3/8 inch headspace. Works perfectly now. I purchased a power pressure xl pressure/Canner. It states on the last page of instruction that you can’t can in altitudes of 2000 feet.I am in Arizona at low elevation. Can I use it by adjusting the time. Or should I just by something else? We will be travelling with home canned jams and salsa. We are at sea level and travelling to 6000 feet. If some of my jams and salsa pop, once we reach 6000 feet can I re-can them? Travel time, 3 days. I can at 10,000 feet in Colorado. It takes forever, because of the adjusted times, but is well worth it through the long winter!!! I live at 7,600ft, grew up canning at 5,000 feet. It sure would be a lot nicer to to can on a beach 😉 and a heck of a lot faster.